Government Pond was the traditional industrial waste and sewage outlet in the City. Sewage flowed untreated into the Charlottetown Harbour for many years before the sewage treatment plant was constructed. Beaconsfield, seen above behind Government Pond, was the residence of shipbuilder, James Peake Jr. Constructed in 1877, it was one of the most modern residences in Charlottetown. It was one of the first houses in the city to contain a water closet and its sewage was pumped directly into the Charlottetown Harbour. This was 21 years before Charlottetown had a sewer system. George Waring (right) was a Sanitary Engineer, Civic Reformer and Author of the “Report of the Sewerage of the City of Charlottetown”, the document used in part to plan Charlottetown’s sewer system. 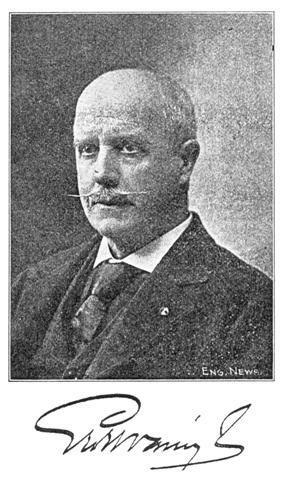 Well respected in his field, his work took him all over the United States and Canada, as well as Cuba where sadly, he contracted yellow fever and died in 1898, the year that Charlottetown’s sewer system was implemented. 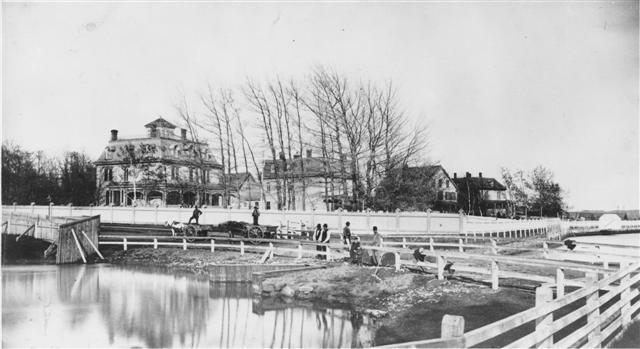 The Charlottetown Sewerage Act was assented 14 May 1898 and the Commissioners of Water Supply became the Commissioners of Sewer and Water Supply. The commissioners were Hon. David Leard, Peter Halloran and Henry Smith. The Commission continued until amalgamation in 1995, when water and sewer became a department with the City of Charlottetown.